Hawaii’s favorite food—poke—has been around for centuries. One thing all poke has in common is cubed, raw fish. From there, the variations are endless. 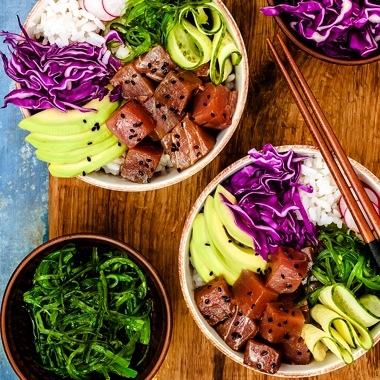 It’s a healthy staple, and poke bowls are now gaining popularity across the United States. “It is a Hawaiian traditional dish, and nowadays can be done many ways and is more and more popular around the world,” says Kauai native Noelani Planas, executive chef at Ko’a Kea Hotel & Resort’s signature restaurant. Red Salt is the four-time recipient of Honolulu Magazine’s Hale ‘Aina awards for best Kauai restaurant. The restaurant offers fresh seafood and local produce in a casual yet sophisticated seaside atmosphere. Dinner entrees include seared ahi or mahi, caramelized ono, seafood risotto, lobster ravioli and shrimp carbonara served alongside craft beers, tropical cocktails, martinis and an extensive wine list. In addition, Red Salt features an evening sushi bar Tuesday through Saturday, as well as a daily breakfast buffet and an early bird menu of made-to-order dishes. To learn more about Red Salt or to make a reservation, click here.